HYPHY'S is a restaurant located at the Veranda Robinson Galleria owned by Chef Bruce Lim. The term came from shortened English dialect "hyperactive" of San Francisco Bay area. Chef Bruce Lim is also the Asian Food Channel's Filipino Food Ambassador but he always want HYPHY'S to be an extention of his home kitchen and crafted it as his personality. A very busy Chef whose presently touring around the Asia to work and share his knowledge as master of kitchen. I'd never got a chance to meet him when we visited at HYPHY's but I can assure you that his soul in cooking is left there at the food starting to pour over our table. It's lunch time when we begun to taste the freshness and authenticity of every meal. Started with Clam Chowder (170Php), they even made the bread itself to assure the freshness of each dish. The can not forget the richness and creaminess of thick clam and potato soup the combination of ingredients is so perfect. Cobb Salad (260Php) a variation of the classic chopped salad topped with tomatoes, bacon, chicken, olives and cheese. The grilled taste of chicken added the freshness taste of salad. Calamansi Tuyo Pasta(130Php), who would ever think that Tuyo (dried salted fish) can uplift the taste of a pasta, yes it can, Chef Bruce really made this dish authentic for Filipinos and Pinoy at heart. I really like it. You dont need to put cheese on it. Briliant!! Chicken Chow Mien (198Php) is Chef's favorite since he has in grade school no wonder why he mastered to cooked it a dry stir fried noodles tossed with chicken strops and stir fried with seasonal vegetables. SF Steak Sandwich (290Php) a Stonetown steak sandwich inpire Chef to have this in his menu as thin sliced beef with sauteed onion and peppers topped with cheese and stuff in bread served with fries potatoes. That was for our appetizers the main meal are then ready to served in 5 minutes they all line-up in our table. I tasted all of them and I cant even pin point what is my favorite among them because it all tasted great. 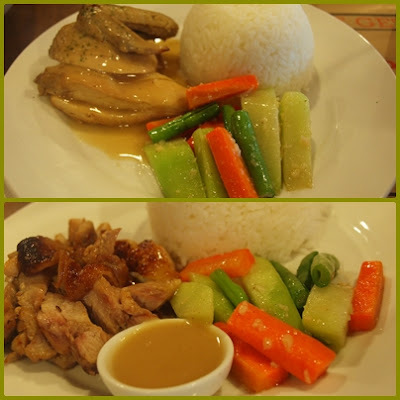 We ordered the Grilled Chicken (230Php) a backyard BBQ style chicken grilled to perfection served with rice and garlic buttered seasonal vegetable and Roasted Chicken (290Php) which is slowly roasted Filipino herbed chicken.Thats fo the chicken lovers. For the fish lovers heres the menu that would give you a healthy and delicious meal. 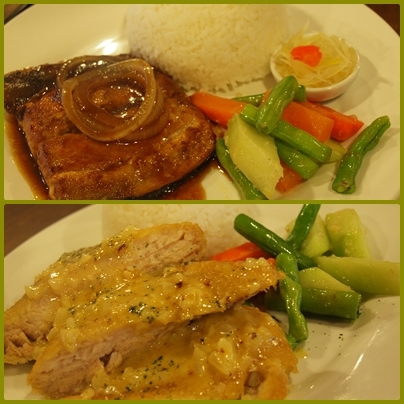 Like the Bangus Steak (210Php), a deboned milkfish marinated in special sauce and the Dapa Fillet (350Php) a Pinoy sand daps breaded and pan fried until golden brown. If you prefer meat (pork) they also prepared a sumptuous meal that you will remember until you got home. 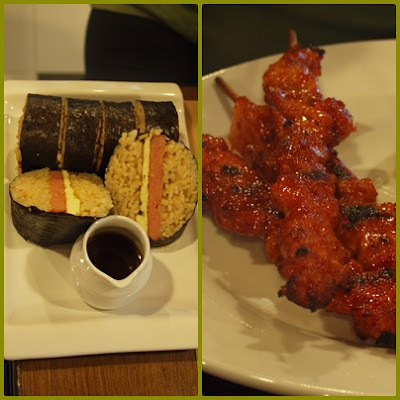 The Spam Masubi (300Php), originally from Hawaii, slices of spam tooped with egg and rice wrapped perfectly in seaweed don't forget to pour the sauce.And the Kanto Pork BBQ (220Php), grilled slowly to be tender and extract the meat juice. 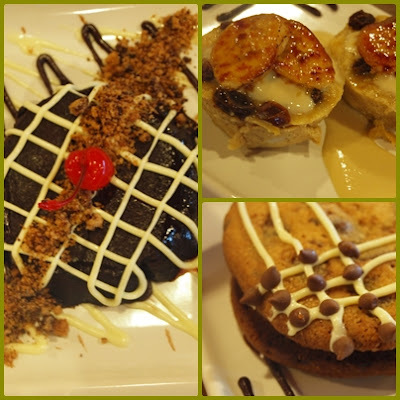 For our desert are the Tablea Chocolate (150Php) a chocolate and coffee taste made into very thick ganache style cake topped with whipped cream, Bread Pudding (120Php) bread soaked in custard and bake until golden brown and the Choco Chip Sandwich (120Php) a homemade cookies sandwich in vanilla ice cream served with warm chocolate. That's it, I hope I made you hungry hehe... 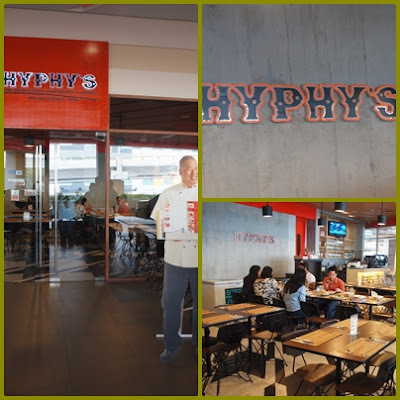 If you want to taste and experience the San Francisco and Philippine Cuisine by Chef Bruce Lim just visit HYPHY'S at The Veranda Robinsons Galleria. Dont forget to "Like" them on Facebook.